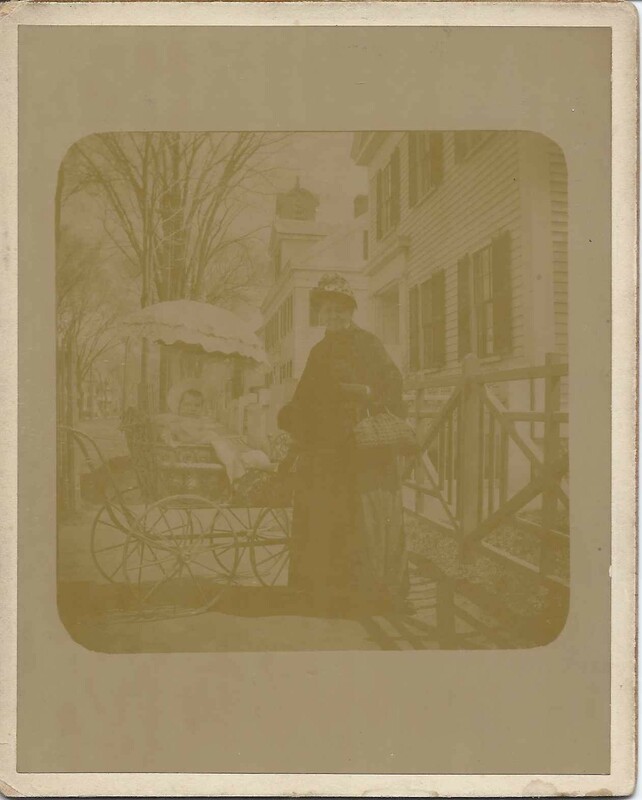 Photograph dated May 1893 of baby Ralph W. Hill and Aunt Emily Willey on Washington Street; sadly, no town or city is mentioned, but I believe the photograph was taken in Massachusetts, perhaps on Washington Street in Boston. Using the names and the relationship, I was able to figure out their identities. The baby was Ralph Weston Hill, born 14 October 1891 at Lynn, Massachusetts, son of Allen Webster Hill and Elizabeth (O'Flaherty) Hill. Ralph grew up at Peabody, Massachusetts, and eventually moved to Medford. Census information indicates he had four years of college. He was an executive. He married a Rachael, whose maiden name I don't yet know, and had at least one child. 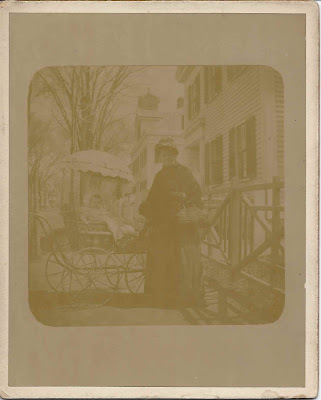 Aunt Emily was Emeline, or Emily, Eliza (Hill) Willey, born 27 April 1819 at Danvers, Massachusetts, daughter of Benjamin D. and Eliza (Weston) Hill. In 1849 Emily married New Hampshire native Charles G. Willey. The 1880 Census shows them living at Boston, Massachusetts, where Charles was a cutter in a shoe factory. Perhaps they were still at Boston in 1893 when the photograph was taken. 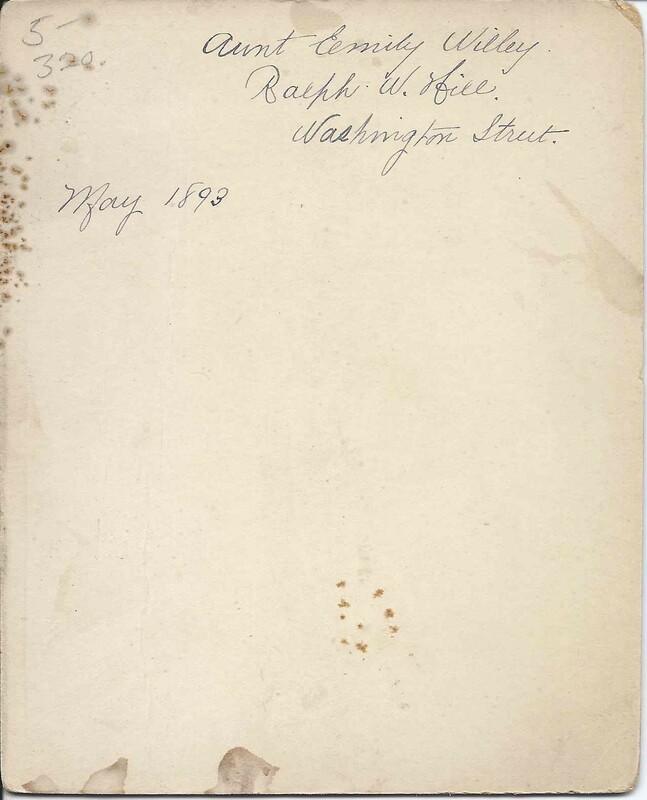 One of Emily's brothers was Seth R. Hill, born in 1822. Seth was Ralph's paternal grandfather. 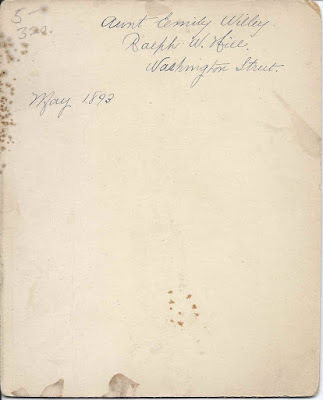 Perhaps the photograph was taken when Ralph's parents took him to visit his great aunt at Boston.